We headed to my sister's house a few weeks back for an indoor bbq to celebrate my niece's birthday. She served up a tasty meal. The part of the meal that really had me going back for more was this salad. One bite and I knew exactly what I was going to serve this with once I added a key adaptation. Y'all might know that I am a big fan of the sweet and savory combo. This salad certainly checks both of those boxes. 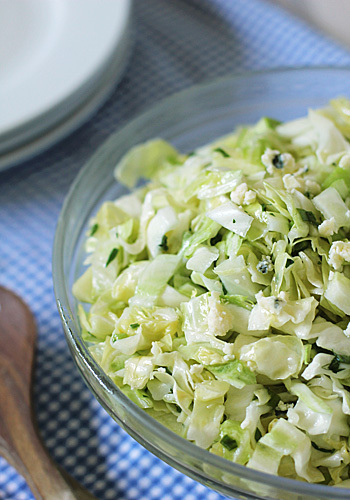 Sweet apples and a sweet, tangy dressing are tossed with savory cabbage and green onions. I add a bit of flat-leaf parsley for freshness. But what really sealed the deal on this combination of flavors was the addition of crumbled blue cheese. It ties it all together even for those who are not big blue cheese fans. This slaw would certainly be enjoyed with just about any food on the table, but it really is a winning side to the Hickory Smoked Beef Brisket that we enjoyed on Sunday. Toss the cabbage and salt together in a large colander set over a bowl. Let stand until wilted, about 1 hour. 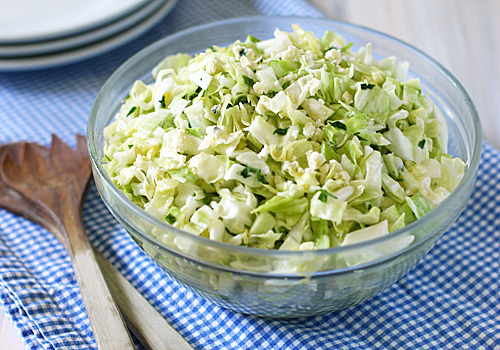 Rinse cabbage under cold water, drain, dry well with paper towels, and transfer to a large bowl. Add the apples, scallions, and parsley and toss to combine. In a small saucepan over medium heat, bring the oil, vinegar, sugar, mustard, and red pepper flakes (if using) to a boil. Stir the mixture to ensure that the sugar has dissolved. Pour the dressing over the cabbage and toss to coat. Cover with plastic wrap and refrigerate for at least 1 hour or up to 1 day. Just before serving, add the blue cheese and toss to combine. Enjoy! I love apple and cabbage in salad together. They bring out the best in each other. This is perfect for summer. This looks great! I'm not the biggest fan of blue cheese, but I think I'll try this with goat cheese instead. Thanks for sharing! This was delicious - loved the addition of blue cheese. It paired perfectly with the green apples. Yum.